A teacher librarian with a wandering spirit and wondering brain. 7/3/2016 - On our drive home, we made a stop in Shanksville, PA to visit the Flight 93 National Memorial. This is the final resting place of the heroes of the flight that was hijacked and headed to DC on 9/11. Words cannot describe the feelings this place stirs in your soul. It is a stark and nearly desolate valley in a landscape surrounded by mountains. The memorial is still evolving and under construction. The pictures below are the ones that I felt reflected the feelings of the place. God bless these American heroes. Their courageous, swift action and bravery saved an untold number of lives that day. 7/2/2016 - We traveled to Gettysburg, PA today. I believe that the best way to learn is to immerse yourself in knowledge in an authentic setting. Gettysburg is definitely the place to do just that if you want to learn about the Civil War. Although my brain was full from my week at the Library of Congress institute, I made room for more. I was certainly not disappointed in this memorable visit. We decided to take the bus tour so that we could hear from an interpretative guide. Our guide was so knowledgeable about the monuments at Gettysburg that he wrote a book. I have many photos but I am only sharing a few here. My institute activity plan is based on the Civil War, so my visit was timely, authentic and informative. Magic Lantern Show - The Library of Congress offered a special program on Friday called a Magic Lantern Show. It was really interesting and I'm glad we took the time to see it. Folger Shakespeare Library - An entire library devoted to the works of Shakespeare. Be still my heart. We saw the First Folio and heard from an expert about some of the interesting facts about the plays. National Air and Space Museum - On this day, 40 years ago, this museum opened its doors. We were there this evening for a celebration and special program to commemorate the birthday. The museum was open all night for this event. Our plans had been to visit the museum, however, the lines were too long and moving too slowly for us to gain access. We were still happy to have witnessed the birthday celebration. Free Books - Yes, Please! 7/1/2016 - During my week at the LOC, I participated in another grant program called the Surplus Books Program. Eligible educational institutions are allowed to select books for their institution. I pulled books each day before the institute began and a couple of times during the week. Joseph, the staff person in the Surplus Book room, was very helpful and made sure that we were able to have access to select as much as we could bring home. I secured 189 books for my school library. My students will be very excited about the new titles. This program is open to all public schools. If you are going to be in DC, I highly recommend you apply and participate in the program. The photo below is just one row of books I had to choose from. There were at least 8 rows that housed 19 3-foot shelves 6 high on each side. I did not have nearly enough time to look through everything but I got lots of current materials that will be a much needed addition to my collection. Thank you Library of Congress! 6/29/2016 - Day 4 of the institute - amazing! This day I was able to focus and be intentional in my researching. This was also the day I put my Reader Card into action. I visited two reading rooms - Newspapers/Periodicals and Photos/Prints. These rooms are very intriguing. The reference librarians in both areas were knowledgeable and accessible. I was given all the help I needed and even a little more. In the newspaper room, the staff gave me stacks of bookmarks and posters to bring back to school about "Chronicling America" project. It was a glorius day and I felt completely immersed in learning and inspired by the knowledge surrouding me. I completed a draft of my activity plan late in the evening. I was completely exhausted but on a high from my experiences. My journey here will soon be over but putting the plan into action will be the real journey and where the fun begins. Disclaimer and apologies: By the 3rd day of the institute, I've been so busy I could not blog each day. I'm sorry to those who were following my daily activities. I am now posting my reflections for each day and will mark them with the date. Thank you for reading along! 6/29/2016 - Day 3 of the institute - peer review day! Here's my problem - I don't have a specific activity plan yet. I started day 1 with a plan, switched on day 2, and here I am on day 3 realizing my plan needs to change again. That is what this institute is about though - growth! So, by that standard, I have succeeded because I am so far removed from my comfort zone that I don't even know how to get myself back in my box. After talking through ideas and plans with my peers, I decided on an activity focus and hit the research ground running. I have learned so many great instructional strategies to use with primary sources. I can't wait to get back to school and work with my students using these strategies. After my day of work at LOC, my husband planned a date night for us. It was absolutely fantastic weather and perfect evening - Georgetown Cupcakes, Old Glory Bar-B-Que, and the Thomas Jefferson Memorial. I had only driven by the Jefferson Memorial, so seeing it and getting to read the inscriptions was very moving. Here are a few pictures from our evening. Day 2 of the LOC Summer Teacher Institute was as amazing as the first day. I have to say that learning how to analyze primary sources is tough brain work. I am so grateful to have this opportunity to learn so many strategies and resources to use in my library program. Networking with my colleagues from across the country has been valuable and I'm sure I will continue to learn many new things from them. After our session about selecting primary resources, I decided to change my project focus. I will share more details about the project another day. The absolute best part of the day was the private tour of the LOC's main reading room. It was a behind the scenes kind of tour where we were taken into the card catalog room. Wow - that was unbelievable. Rows and rows of card catalogs. We were allowed to take flash photos, so I have included a few here. The wonderful librarian that hosted our tour had the best quote. Here response to the question "Will the library ever not have print books?" was "No, we will always have books because the library would look funny if we didn't." Awesome! At the close of our day, we bought dessert at a great local place called Firehook Bakery and we happened in to a small restaurant called Sonoma Restaurant and Wine Bar. Both places were very satisfying and I would recommend them to any DC guests. I can't even put into words how excited I was for this day to begin. 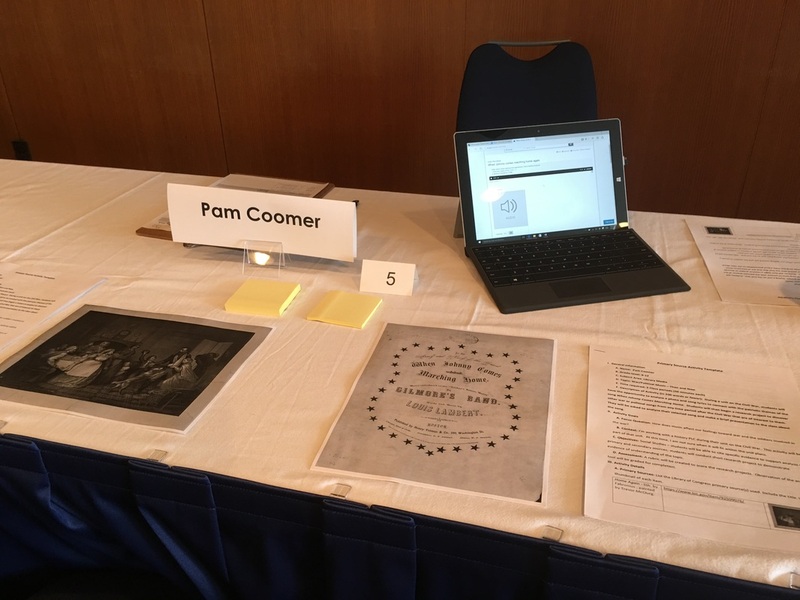 The first day of the Library of Congress Summer Teacher Institute. I even arrived early to the Madison Building which is rare. Unfortunately, the building didn't open for visitors until 8:30. So, I stood outside in the beautiful morning air and reflected on . . . who am I kidding? I was having a debate in my head with the security guard that wouldn't let me in. I mean didn't she know who I was? But I digress and she was doing her job to protect the employees of the LOC. Kudos to you security guard! I really did feel like I was a kid going to kindergarten. We jumped right in and kept busy the entire day. It was the best day of professional development EVER. I know that the rest of the week will prove even more impressive. One of the best parts of the day was getting my LOC Reader Card. Okay, maybe the very best part was the personal tour of the library. But still, I have an LOC Reader Card. How cool is that? (see the picture below) At the end of the day, I went to the basement of the LOC to find the Surplus Book Room. I am fortunate to be able to participate in their Surplus Book grant program. I will be able to bring back to my high school library about six boxes of books. This is a great program. If you are going to be in DC, you should definitely check it out. After all that work, I needed a little sustenance. We found a great Mexican restaurant and were lucky because it was free queso Monday. Score! It was an amazing day. Tomorrow will be even better because we have a behind the scenes tour of the Main Reading Room. Stay tuned! Sunday, June 26, 2016, as I remember it the next day. We began our day with a worship service at the National Cathedral. What a beautiful and magnificent place. The rest of the day was spent exploring and being tourists - hop on and off bus tour, Newseum, monuments tour on the Potomac, dinner in Old Towne, Alexandria, VA, water taxi to the National Harbor in Maryland, rode the Capitol Wheel, and then took an uber back to DC. Boy was I exhausted! I had to go straight to bed because Monday was the big day - the first day of the LOC institute. Hi! 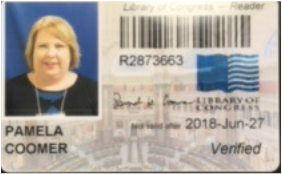 My name is Pam and I am a high school Teacher Librarian. I have a passion for learning, books and techie gadgets.